Up until fairly recently, airbrush makeup was something you'd only see on models and celebrities and people who spend their lives in front of cameras. It was kind of an exotic option that was reserved for people who were in showbusiness or media, and most people didn't really know about it. All that has changed, though, and the best airbrush makeup kit that was once reserved for VIPs and public figures is now available to everyone—and we're thrilled about that: airbrush makeup is remarkably effective at concealing acne and scars and wrinkles and discoloration, and when it's applied properly, that coverage can last a very long time. The odd thing is, a lot of people still don't realize that airbrush makeup is a daily option, and that it's surprisingly easy to use. So, below, we’ll take a deep dive into airbrush makeup: we’ll discuss the airbrush makeup kits we recommend (and why), talk about what you may want to consider when purchasing one, and then we’ll talk about the benefits of airbrush makeup, and how it compares to traditional makeup. Dinair Airbrush Makeup Starter Kit: Our choice for best "Deluxe" model, and our pick for best kit overall. Small bottles of makeup and blush may need to be replaced before long. If you're new to airbrush makeup, the TRU Airbrush Kit may be a great kit to start with. Not only does it come with all the tools you'll need—stylus, compressor, and three foundations and a blush—but TRU has a pretty decent series of helpful YouTube videos, that show you how to load the stylus, how to clean the airbrush, and how to apply that actual makeup. That's a nice touch—there are fewer "big names" in airbrush makeup than in traditional makeup (we can name dozens of traditional makeup companies off the top of our heads, but can't do the same for airbrush makeup companies! ), and that means there's less online about how to use them—it's great that TRU offers a little guidance on how to use their products, as most airbrush makeup companies don't do that. The other thing that we like about the TRU Airbrush kit is that it features skin-friendly makeup (they've incorporated only a few natural products, instead of the long list of weird chemicals you'll find in traditional cosmetics), and combines it with long-lasting use. TRU advertises that their foundation can last 18 hours—and we kind of doubt that, honestly; 18 hours is an incredibly long time—but even if it stays on for 12 hours, that's pretty fantastic. It's not perfect—there are plenty of kits that come with a lot more cosmetic and bigger quantities of that cosmetic—but we think this is a great kit, and a good option to learn on. The anti-aging primer is underwhelming. The Art of Air Airbrush System Kit is a great all-around option: it comes with a lot of different foundation colors (so if you've always had a hard time finding the foundation color that works for you, you might have some luck mixing the right color), and the set allows for different air flow rates, which means that you can apply the airbrush makeup as light or heavy as you like. We think this is a great model for anyone who wants to make airbrush makeup part of their beauty routine, but we think it's a particularly good pick for the budding makeup artists in our audience. Makeup artists need to be able to blend tones and find the foundation colors that are going to work on each individual client, and having six different foundation tones to choose from can help you discover the range of colors and airbrush kit can create. Plus, the air adjustability is a great feature—you can change the airflow not only in the compressor, but also in the stylus itself—and artists will need to vary application for each client they meet. Our only gripe is that the cosmetics that come with the kit aren't as skin-friendly—they've got a few odd-sounding chemicals included in their ingredient list—but they're still a little better than traditional makeups, and the makeups that come with the kit are still hypoallergenic, silicone-free, fragrance-free, and oil-free. Petite, and good for travel! it's designed to provide broad coverage! That's the most important thing, really. Our only complaint would be that it comes with only five skin tones, and the samples could be a little bit larger, but that's not the worst thing, as dedicated airbrush makeup wearers tend to go through bottles pretty regularly. And, last thing—it's vegan and cruelty-free! There are PLENTY of vegan and cruelty-free options in the world of traditional makeup, and it's nice to see that some airbrush makers are following suit. A *ton* of helpful videos on YouTube. We review a lot of makeup products, and to be honest, a lot of them a very similar, and there's no product that are really unique. In the category of airbrush makeup, though, the Dinair Airbrush Makeup Starter Kit is truly a standout. The first thing, and perhaps the most obvious, is that it comes with a LOT of gear: it's got a black compressor that you can adjust to control air dispersion (very good), a capable airbrush with a six-foot air hose (great if you have a challenging bathroom / vanity environment), and a WIDE range of makeups, including foundations, multi-color sprays (that you can use for blush, shimmer, and so on), bush, highlighters, and a few other things. That's definitely one of the best things about the package—with a whole assortment of colors, you may be able to experiment and find what works for you. Dinair seems to understand that airbrush makeup is *still* kind of a novelty item, and even though it has so much to offer, most people don't have an intuitive sense of how to use it—and so they've created dozens of how-to videos on their YouTube page. They provide videos on how to use the device—how to load it, how to mix colors for foundations, and how to clean it—but they also have videos on how to get certain looks: there's help on the basics, like how to apply foundation, but also on advanced topics, like how to airbrush eye shadow, how to highlight and contour, and how to get a smokey eye look. There's even guidance on how to do a Day of the Dead look, if you want to get creative. They also seem to understand that airbrush makeup isn't like traditional makeup, and that sometimes you'll have problems with the compressor, the pen, cleaning it, and so on, and they have a great customer service line (that number, by the way, is (800) 785-4770, if you need to call!). They also offer a three-year warranty on the kit, which is a nice touch—most of the models we've seen have a year-long warranty, if they have one at all. And, lastly—and most importantly—the airbrush gun and the makeup itself are designed to provide a wide range of coverage, and cover/conceal beauty marks, scars, acne, wrinkles, and discoloration. It seems very easy to apply, and the makeup itself seems to have great lasting qualities. Dinair may be the most famous name in the airbrush game, and we think they deserve it—they get our vote for best airbrush makeup kit overall. Getting into airbrush makeup can be a little bit intimidating—especially if you’re buying your first kit. In this section, we’ll go over the actual parts featured in an airbrush makeup kit, and once we’ve provided clear definitions of each of those parts, we’ll go over the different options you have for each part. The airbrush—sometimes called the gun, or the stylus, if you want to be fancy—is what you hold in your hand and use to apply the airbrush makeup. It uses a needle-sized opening to gently release aerated pigment onto your skin, and when you’re selecting an airbrush, there are two main features you’ll need to decide on: single-action triggers vs. dual action triggers, and gravity feeds vs. siphon feeds. Let’s take a look at what those terms actually mean. Single-Action. This is the “original” airbrush trigger, and it’s very simple and easy to use. Basically, it’s an on-or-off button you push or turn to start releasing the airbrush makeup. As you hold down the trigger or nozzle, a fine stream of pigment is released. That’s actually a negative, too, because it means you don’t have a great deal of control over the level of pigment that comes out. With a single-action airbrush, the level of spray is fixed, and the only way that you can adjust how much pigment comes out of the nozzle is by changing the nozzle itself (which can take a lot of time, and can be a hassle), or by fine-tuning the dial on the compressor (which can also take a lot of time, and be a hassle). Dual-Action (sometimes called “Double-Action”). These are newer, and they allow you to change the intensity or stroke size using individual controls for air and makeup. Instead of simply being off or on, they let you vary the intensity of the makeup that comes out of the nozzle—you typically pull back on the trigger to modify the air pressure, and push down to release the cosmetic. Because dual-action airbrushes are so much more versatile, they’re usually the go-to option for makeup artists, estheticians, and professional cosmetologists. Having the ability to vary the amount of makeup coming out of the airbrush enables you to apply more makeup to certain areas (like blemishes or wrinkles or other imperfections). There’s another advantage, though, and that’s the ability to simply blow air—without any makeup—out of the airbrush, so that you can dry the makeup after you’ve applied it. That’s something you can't do with single-action airbrushes, because if a single-action airbrush is on, it’s shooting out makeup. As you can see, the pigment sits in a bowl at the top of the stylus and is fed into the nozzle naturally. The main benefit of a gravity feed is that you can add new pigment whenever you like, and you can see how much you’ve got left. The only down side is that you have to be careful—if you tip the airbrush, the pigment will fall out! They’re also great for detail work, and with some practice, you should be able to apply makeup with a decent amount of control and accuracy. The reservoir on a siphon feed airbrush is usually a lot larger than the siphon feed on a gravity feed airbrush, and that makes it a great option if you’re going to be airbrushing a broad area. Siphon feeds are very popular for makeup artists who apply cosmetic to someone’s entire body (spray tan would be an example, or body art), and because you’ll be covering a lot of ground, you don’t want to constantly adding more pigment to the reservoir. However, siphon feeds aren’t as good for detail work. Because they require a little more air pressure to use, that makes them a little harder to control, and that can make them difficult to use for new makeup artists and cosmetologists. Again, if you’re airbrushing a large area, that’s not a problem, but if you’re doing fine detail work—like around the eyes—a siphon feed can be a challenge (although many skilled makeup artists use them without any problems. Skill level is a definitely a factor when it comes to airbrush makeup). So, if you’re interested in applying airbrush cosmetics to your face, the best airbrush makeup kit for you will probably feature a gravity feed. NOTE: There is a third type of feed, and that’s a side feed, but those are a little less common (and we have less experience with them!). The compressor is what makes the tool work—it’s basically the “engine” of the airbrush kit. It pushes air through the tube connected to the airbrush stylus, and then that air mixes with the makeup and sprays out of the airbrush in a fine mist. Most people understand the importance of the airbrush, but the compressor is pretty important, too. The amount of air that the compressor creates is measured in pounds per square inch (PSI). As a general rule of thumb, you want a compressor that has a range from 0 to 35 PSI. Anything stronger than that could be physically painful, and most airbrush compressors that you use on your face feature airflow around 15 or 20 PSI. In fact, most makeup airbrush kits don’t even list their PSI—they’re designed to be very gentle. The only time you might want a compressor that might be stronger is if you’re using it on the body, perhaps for spray tans or for sci-fi makeup artistry. In that case, a higher PSI would make sense—body skin isn’t as delicate as the skin on the face, and you’d need a little added pressure in order to apply the makeup. One last thing, before we move on: you may want to select a compressor that you like the look of. They’ve come a long way, and they used to be simply awful-looking. They were little machines and they had a bunch of jagged parts and knobs and dials, and they did NOT have the intimate, comfortable feel that you usually equate with cosmetics. Companies finally started making compressors that hid all those parts, and most of the compressors you’ll find today are sleek and sophisticated and stylish. If you’re consider a purchase—and if you’re planning on using the airbrush kit on clients or other people—you may want to consider the look of the compressor, and make sure it doesn’t look like a car engine! Finally! The best of an airbrush kit: the actual makeup. A complete airbrush makeup kit will usually include cosmetics—some simple kits will include a foundation, in a couple of different tones—and more high-end/professional kits may also include bronzer, blush, highlighter, and/or shimmer. Let’s take a closer look at some of the details you may want to keep in mind. Foundation is the most important component of an airbrush makeup kit, and it’s the reason most people use airbrush makeup. It creates a base that evens out your skin tone, conceals blemishes, and serves as the blank canvas for the rest of your makeup application. Water-based foundations feel nice and light compared to silicon-based airbrush cosmetics, and they can be a little easier to apply. They’re less likely to cake, and they’re good if you’ve got oily skin—in fact, they’re good fit no matter what kind of skin you have, because you’re a lot less likely to have a reaction to a water-based cosmetic than a silicone one. Plus, they’re easier to clean out of your airbrush gun, and that can be a big plus, because cleaning those guns is important. They’re not as long-lasting, however, and that’s a big deal if you’ve got a big event planned, like a wedding or an all-day presentation, and they’re not great for very hot or humid environments—and there also not great when they get wet (and that’s any kind of wet—sweat, tears, whatever). Silicone foundations, on the other hand, are water resistant, and they can stay put way longer than water-based makeup—and that includes in hot and humid environments. They have better blemish-covering properties, and very often, it’s easier to create a uniform base when you’re using a silicone foundation. The problem is, however, that it can be a little more difficult to apply, and many women have allergic reactions to the silicone itself. No fun. Plus it’s harder to clean out of the stylus—also no fun. If you’re just getting started, you might want to use a water-based foundation, because it’s easier to work with. As you gain proficiency, you can start experimenting with silicone-based foundations, and explore different tones—kits that come with several foundation colors can allow you to custom blend the foundations, so you can find the right match for the skin you’re covering. One thing we should mention, before we move on: you cannot use regular foundation with an airbrush makeup kit. It’s too thick, it won’t go on properly, and worst of all, it will clog the airbrush gun. Airbrush foundation is specifically made for use with airbrush guns, and you’ll find that it’s thinner and more weightless than traditional base. That doesn’t mean it’s not effective, though, and you can enhance the level of coverage by making multiple passes over the skin—and that’s the best part about airbrush foundation: even with more layers, it doesn’t feel as thick or weighty at traditional foundation. Many people buy airbrush kits just for the foundation, but if you want to add color—or if you want to become a makeup artist, and you’ll need to know how to use every type of airbrush makeup—you may want to look for a kit with blush and/or bronzer. They can add color and contour, and because they’re misted/sprayed onto your face, you may find that you can achieve different results that you might with traditional varieties. We have one bit of advice—and this goes for the shimmer and highlighter, too—if you use the blush and bronzer that comes with your kit and it doesn’t look fantastic, you may want to search for another blush/bronzer that works for you. In our experience, the foundations that come with airbrush makeup kits are very good, but the blush and bronzer—because they’re kind of “secondary” when it comes to airbrush makeup—may not be as impressive, and may not be as high quality. Something to keep in mind if you’re not getting the results you were hoping for. And, as always, if you’ve got a big event you need to look great for, do a couple of practice runs to see how things turn out. Also great add-ons if they come with an airbrush makeup kit. Just remember, highlighter and shimmer should be used sparingly. When applied to the areas of the skin that would naturally reflect light, like the brow bones and cheekbones, highlighter and shimmer will make the face look dewy and natural—but too much might result in an odd, over-exaggerated look. And, as with blush and bronzer, don’t assume that the type that comes with the kit is going to be perfect—it might not be, and you may want to experiment with other brands. Unlike regular makeup, which is applied with fingers, a sponge, or a brush, airbrush makeup is sprayed onto the skin in a fine mist. Although certain types of airbrush makeup can be blended after application, coming in with brushes or blenders can detract from the hazy airbrush finish, which gives you a soft, “covered” look. This a common mistake among new airbrush users: holding the gun too close to your face (or your client’s face). It would seem as though that’s too far away, and the mist won’t be able to reach your face, but the opposite is true: the cosmetic needs space to expand in the air before it lands on your face, and it can’t do that if the stylus is too close to your skin. So, when you’re airbrushing away, hold the stylus about 6 to 12 inches from your skin and move your hand continuously. The trigger is quite sensitive and should let you adjust the amount of product that you spray on, and if it feels to intense, you can decrease the flow a little bit. There’s one way in which airbrush makeup is a much bigger pain that traditional makeup, and that’s CLEAN-UP. With most traditional makeup, you don’t have to clean anything up after application—if you use a foundation, you simply put the cap back on, and you’re good to go. That’s not the case with airbrush makeup, though. The stylus gets very dirty, and if you don’t clean it and remove the makeup, the leftover residue can discolor the other types of makeup you use in it—and that’s very bad if you’re just using it on yourself, but it’s VERY bad if you’re a makeup artist and you’re using it on someone else. Also, leftover makeup in the airbrush can clog the nozzle, and damage it, and that’s also not good. That’s not all, though. If you’re not properly cleaning the stylus and nozzle after you’re done, then next time you use the airbrush, you could be applying old airbrush liquid that has sat around for a little while, and developed bacteria and other microbes—not great for your skin. So, even though it can be a pain, make sure to clean the airbrush gun whenever it needs it. Airbrush Makeup vs. Traditional Cosmetic Makeup: What's the Difference? We get a lot of questions about regular makeup vs. airbrush makeup, so this seems like a good place to compare them. Before we wrap up, let’s take a quick look at the differences between these cosmetics. If you’re adept at applying makeup with an airbrush and by hand, you can achieve a well-blended, immaculate look with either type of product. You’ll probably use more actual product when applying traditional foundation, but you can achieve similar results, and you should be able to conceal blemishes, create an even skin tone, and provide a base with each. The big difference in coverage is the way it feels. Airbrush foundation, in our experience, just feels lighter—and that’s a fantastic thing, for a cosmetic that has a reputation for being heavy. Some women like the feel of a thick foundation, but many do not—and airbrush foundation can be a great alternative. There are some traditional foundations out there that last a LONG while (we love you, Max Factor! ), but even the best of those can get cakey, and in a worst-case scenario, can crack. And that’s another win for airbrush makeup: depending on the circumstances, it can last a very, very long time. Because the product is “misted” on instead of slathered on—that is, because it’s thousands of little misty bits instead of one larger coating—it’s less likely to shift as your day/night goes on. 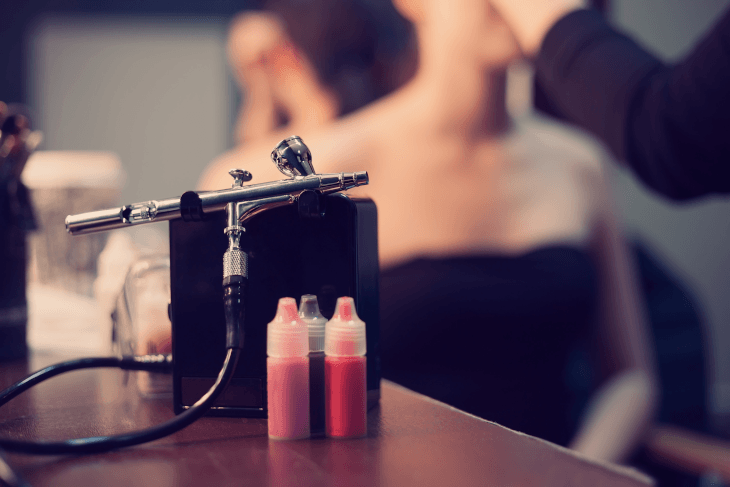 Airbrush makeup is very commonly used at weddings, modeling shoots, dance performances, movies, plays, and just about anything else where you’ll need to be in the spotlight for hours on end. 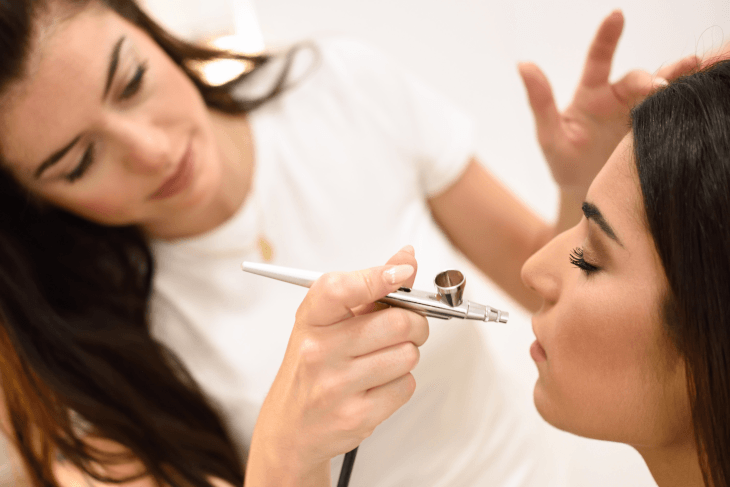 Professional makeup artists like airbrush cosmetic because it can stay on for hours and hours, depending on the variety you use (some can even last up to 12 hours, and sometimes even longer). That means that the person wearing the makeup can go about his or her day without worrying about touchups, which is important in many professional settings. You can also create special effects using airbrush, which is why it’s often used for movies and performances. It can be mixed with certain types of ink and applied with stencils for temporary tattoos. Spray tan professionals use airbrushes to sweep glowing color all over the body. Photo-Readiness: Airbrush is Better for This, Too! Many novice makeup artists don’t realize that they’re not only applying makeup on a model so that she looks good, they’re applying makeup on a model so she looks good on camera. How a cosmetic makes a person appear on camera is something makeup artists always need to consider. Airbrush makeup is ideal for digital photography, because the texture of the cosmetic is so flat. Traditional makeup can have a 3-dimensional quality to it, and that can look odd in images; airbrush mist is so light and 2-dimensional—and coats the face so fully—that it ends up working very well with photographs. You can, of course, achieve the same effect with traditional makeup—and there are millions of women who wear traditional makeup in photos and look great—but airbrush makeup can be a quick and effective way to create a photo-friendly face. Learning how to work the airbrush gun—how to under-do it instead of over-doing it, and how to layer colors—takes a little bit of time, and there’s a lot more instruction online about traditional makeup than there is about airbrush makeup. And not only that, but you’ll need an understanding of traditional makeup in order to get reliable results with an airbrush. If you start learning on an airbrush, you won’t really have a clear idea of what each cosmetic is designed to do. And that’s why we’d suggest that if you’re totally new to makeup, you should start with the basics, and see how they work. Starting with traditional makeup will give you a broader understanding of makeup artistry, and it’ll actually make learning airbrush technique a little bit easier. Many types of airbrush makeup are hypoallergenic, and airbrush cosmetic is applied with such a fine mist, it doesn’t completely cover the skin. This allows your skin to breathe a little bit easier and prevents the pores from getting blocked. If you shy away from makeup because it exacerbates your acne-prone skin, you might consider switching to airbrush makeup, which will cover where you need it to without coating your face like a mask. It’s not a sure thing, but it might help. Another nice aspect of airbrush makeup is that you don’t have to touch the cosmetics or the skin to apply airbrush makeup. The cosmetic itself never comes into contact with bacteria-laden fingers or makeup applicators, and because many people tend to over-use applications and sponges and blenders, they can cause problems for your skin—but because all airbrush makeup misted on, you can avoid that issue entirely. Again, there is a TON of traditional makeup that’s hypoallergenic, and a lot of it works great—but if you think that it’s the actual applicators that are giving you skin issues, airbrush may be a promising alternative. We’re obviously huge fans of traditional makeup—we’ve built an entire site about it—but we’re also pretty enthusiastic about airbrush makeup, both for personal use, and for use on makeup artistry clients. It can be a tremendous tool, and with some practice, it can be a very reliable way to create a dewy, natural look. If you have any questions about airbrush, let us know! Thanks for reading, have fun, and happy makeup!